If you’re comparing 55+ communities in Central Florida, be sure to take a close look at Bear Creek. We’re nestled in the serene wooded beauty of Ormond Beach on the Atlantic coast. Bear Creek is sufficiently shielded by oak groves to feel like the forests of the northeastern United States, but close enough to extraordinary amenities that make life in the Sunshine State so enjoyable. We like to say that Bear Creek is more than a place to live … it’s a lifestyle. More precisely, it’s affordable resort-style living at its finest. That resort-style living starts with the amenities in our community. Bear Creek offers three clubhouses, each with a distinct motif and each with its own pool and spa. 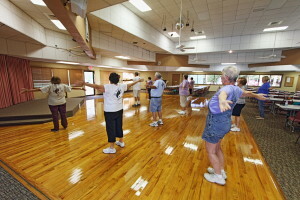 We also feature a state-of-the-art fitness center, courts for playing pickleball, horseshoes, shuffleboard, tennis, and bocce ball, and a stunning array of activities and gatherings that are sure to keep your social calendar full. With an average temperature of 80 degrees, and 300 or more days of sunshine, you’ll never be at a loss for things to do and great weather to do them in. Contact one of our friendly Lifestyle Consultants today to learn more about Bear Creek, and to see how we compare to other 55+ communities in Central Florida.